Dal Tadka is one of the most popular recipe served in Indian restaurants. A mix of moong dal and arhar dal, this is a flavourful lentil preparation from Punjab. Here is how to make a simple and authentic Dhaba Style Punjabi Dal Tadka Recipe. Dal tadka is a staple dish that’s made out of lentils and served with hot rice. It’s popular all over India and you’ll find that most restaurants have their own version of the Dal Tadka or Dal Fry. Punjabi Dal tadka is a little different as two different varieties of dals are used and the spices used are also a little different. Tadka dal with some rice and a dollop of ghee is the ultimate comfort food for most Indians, it’s one dish they look forward to and miss on a long holiday abroad. 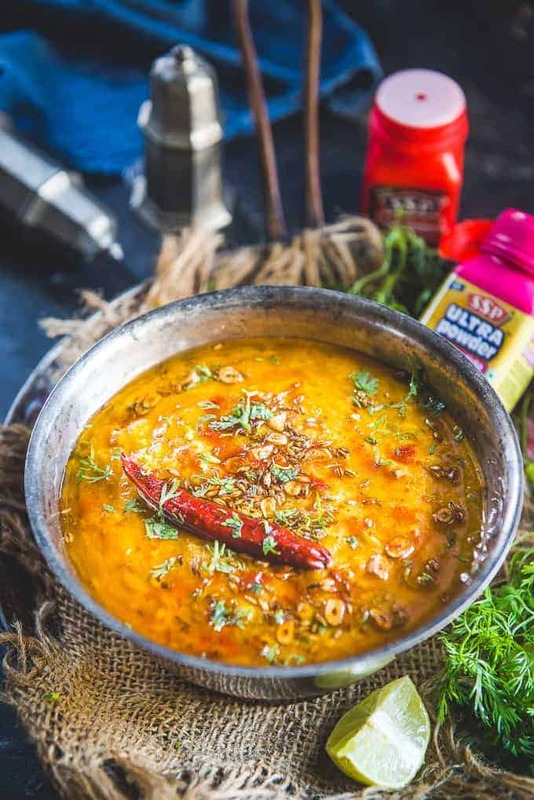 What most people don’t realise is that this Punjabi style dal is extremely simple to make, it requires a few basic ingredients and it can be made in a jiffy. 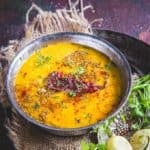 How to make Punjabi Style Tadka Dal Recipe? 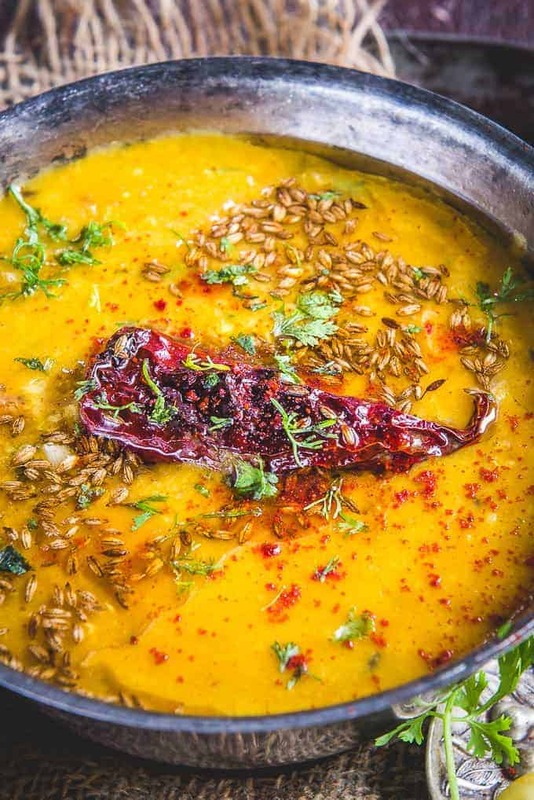 To make this dal tadka, the Punjabi Dal mix of Dhuli Moong and Arhar Dal are to be cooked in a pressure cooker with salt and water until the dal cooks well. Then some ghee is heated in a pan, to which chopped onions are added and fried till golden brown, to this some chopped ginger and garlic are added and fried for a minute. As it’s frying, we add in the chopped green chilli and tomatoes and cook it for a few minutes. Finally some turmeric powder and red chilli powder are added in along with the cooked dal. The water and salt is checked and the dal is brought to a boil, to top it off, some freshly squeezed lemon juice is added and mixed in. A tempering or tadka is made, that’s added on top of the cooked dal. To make the tempering, some ghee is added in a pan along with cumin seeds and hing. It’s left to crackle for a few seconds. To this dry red chillies, garlic are added in until it turns brown. Finally this tempering is poured over the dal and it’s topped with chopped fresh coriander. What to serve Dal Tadka with? The best part about this Punjabi style tadka is that it’s a very versatile recipe and it goes with pretty much anything, it can be served with jeera rice, plain rice and roti. It’s also a popular curry that’s made for get togethers and there’s nothing like a good dal curry to devour a bowl of steamed rice. Do try this recipe for your next meal and you won’t be disappointed. Lentils have been a part of the staple Indian diet for the longest time as they are a great source of vegetarian protein and it also fills you up instantly. If you’re looking at making a simple meal, give this dal tadka recipe a try. Some of the other dal recipes I’ve posted are: Bengali Style Cholar Dal, Lauki Chana Dal, Gujarati Dal Dhokli, No Onion No Garlic Makhani Dal and Malwa Dal. Mostly Punjabi Dal tadka is made using the combination of Moong Dal and Arhar dal but some people also use Moong Dal and Masoor Dal to make it. You can also use Chana Dal or only Moong Dal and only Masoor Dal to make Dal Tadka. Use a mix of either tuvar dal and moong dal or tuvar dal and dhuli masoor dal. Always give two tadka to the dal to give it a dhaba like taste. In the second tadka, make sure the ghee is very hot before adding the cumin seeds. It will make sure to release all their flavour in the ghee. Use very good quality hing to give the tadka as it lends it a very delicious flavour. You can also give a smoky taste to the dal by giving dhungar to it. For adding smoke flavour to dal, heat a piece of coal until red. Keep a bowl in the centre of the dal and keep this hot coal piece in the bowl. Drizzle a tsp of oil over the coal and immediately close the lid of the pan. Let the smoke soak in the dal for 3-4 minutes. Then remove the bowl and give the dal a gentle mix. How to get smoky flavour in Dal Tadka? The dal tadka that we taste at the dhabas or restaurants have a very distinct smoky flavour. That is because they are made on wood fire. To get a similar smoky flavour at home, you can dhungar your dal once it’s made. To do it, heat a piece of coal until it is red hot. Keep a steel bowl in the centre of the dal so that it is not immersed in the dal. Keep the hot coal piece in the bowl. Drizzle 1 tsp ghee over the coal and immediately close the lid of the dal bowl. let the dal absorb the smoke for 10-15 minutes. Open the lid and discard the coal. Your smoky dal is ready. Why is using a good quality hing important to make a good Dal Tadka? To make a good Dal Tadka, using the best quality ingredients gives it a great transformation. They give the dish a right balance of taste and flavour and hing is one such ingredient in Indian cooking which although used in very small quantity makes a big difference in taste. After using many brands of hing in my cooking, I have now zeroed in on SSP Hing. SSP Hing lends a great aroma and taste to any dish in which it is added and just by using a tiny bit of it, your dish can be taken to next level. SSP Hing has three types of variations. The regular powder, granules and the newly introduced ultra powder. I like the shaker bottles in which it comes. You don’t have to open the lid and take out the hing, just sprinkle some in the oil and you are good. To make curries where the hing is added at the start of cooking, you can use the granules and for giving tadka, use the fine powder. They also have two different strength of hing. If you love strong hing flavour like I do, use the powder and if you like very subtle flavour of hing, go for the ultra. To know more about their products, you can visit their website www.sspandian.com . Wash the dal and add it in a pressure cooker. Add 3 cups of water and salt to taste. Pressure cook until dal is nicely cooked. Once the ghee is hot, add onion and fry until slightly browned. Add green chilli and tomato and cook for another 2-3 minutes. Now add turmeric powder and red chilli powder. Now add the cooked dal and adjust the amount of water and salt and bring the dal to a boil. Add lemon juice and mix well. For tempering, heat ghee in a pan. Once the ghee is hot, add cumin seeds and SSP hing. Let them crackle for a few seconds. Add Dry red chillies and garlic and fry until garlic turns brown. Pour the tempering over the dal. Dal Tadka is one of the most popular recipe served in Indian restaurants. A mix of arhar dal and masoor dal or sometimes moong dal, this is a flavourful lentil preparation. Wash the dal and add it in a pressure cooker along with 3 cups of water and salt to taste. Pressure cook until dal is nicely cooked. Remove the pressure cooker from heat and let the pressure release. Mash the dal using the back of a ladle. Now add turmeric powder and red chilli powder and the cooked dal. Adjust the amount of water and salt and bring the dal to a boil. Once the ghee is hot, add cumin seeds and heeng. *This post is in collaboration with SSP Hing. Dal tadka is simply amazing… Nice recipe Neha. What an interesting dish, I’m really excited to make this at home. It’s so different from what I’m used to! I give my tadka in exactly the same way. Lovely recipe. Dal tadka and rice are my favourite comfort food. This looks yumm! Loved the way you have presented the recipe. Also, one thing I have seen when trying different recipes for the same dish is that the final result is always different and a good one too. Lovely way of tempering. I used to give single tadka in my dal. Ll try with double tadka today. Completely agree a good hing adds that extra punch in dal tadka. Neha, I’ve been perusing through your recipes and am very impressed by their simplicity and authenticity. I live in Minnesota aka. the tundra:) and the Dal Tadka will be the perfect antidote to cabin-fever this winter! In the ingredients you said oil and in the receipe you are saying heat ghee. Which one is correct? Apologies for that Florine. I have updated the recipe.